Push for a PB or set a gentle pace. It's entirely up to you! 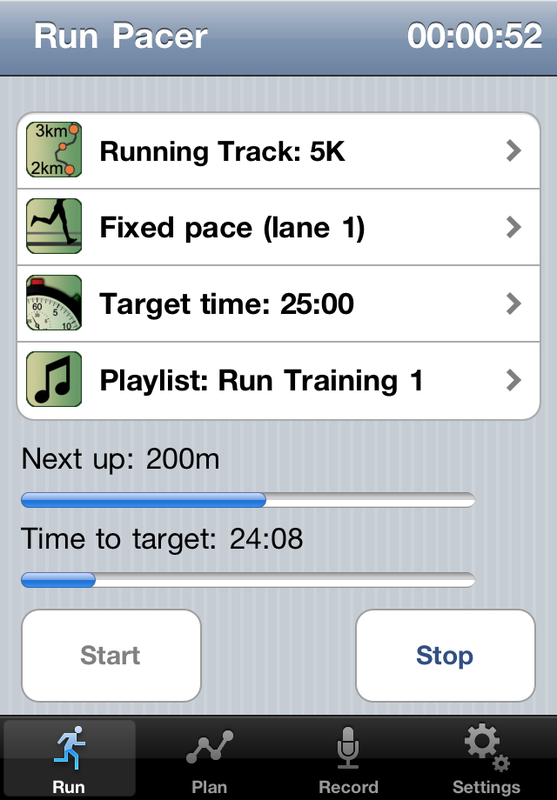 Run pacer is an iPhone and Android application to help you with your running. Step 1. Plan how long you want to take between waypoints on your running routes. Step 2. Go out and run. Stick to the plan (or try to). Listen to run pacer to know where you should be. Run pacer is ideal for use on the running track or on routes that you run often. The Run tab displays the screen you will use for your run. Routes are selected by name, pace, and target time. Choose an existing playlist to run to or pick a selection of tracks. Note that there is currently a minor issue with playlists. See the release notes for more information. Tap the Start button. Start your run when the first audio clip has finished playing. When each waypoint is reached the audio clip for the waypoint will play. Tap the Stop button when you are finished to record your time.